Back in March I started to think about my goals for the summer. I’m a goal oriented person and like to think ahead-it is a good way to fill my free time with productive activities. I didn’t know it then, but my ideas for productive activities were really just urban homesteading ventures. I decided to dry all my laundry on the line and to “put up” foods. Thankfully, hanging up clothing requires little skill and just days after the goal of canning popped into my head I came across the Ball Blue Book of Preserving. The cook book and resource gives step by step instructions of how to can–including pictures, explanations for canning techniques, the low down on canning equipment, a glossary of food preservation terms, and hundreds of recipes. 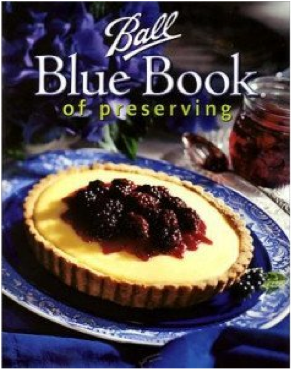 The Blue Book is by no means trendy like my roommates “Jam It, Pickle It, Cure It”, and even seems a little corporate. However, for $5 it has a way to preserve any fruit or vegetable that you have too much of and it is printed on recycled paper. If you have any unexpected results, flip to the back for a list of common problems in home canning. Pick up a copy today to not miss out on all that can still be “put up” for colder times- apple sauce, tomatoes, corn relish, hot pepper jelly, and more! My roommate and I just canned 150 ounces of pickle relish, soon to be paired with homemade ketchup and offered as Christmas gifts. Without the old pressure of feeding a family only from the growing season, canning can be fun and creative as well as a step in the direction of sustainable living. Find a copy at ACE Hardware in Porter Square. The Madison Area Community Supported Agriculture Coalition (MACSAC) is a non-profit organization with a mission to connect CSA farmers and eaters. MACSAC has two annual happenings. The CSA Open House offers member workshops and a CSA farm fair. Their pledge-based Bike the Barns event helps support their Partner Shares Program, which subsidizes CSA shares for low-income families. supporting local farmers in southern Wisconsin. 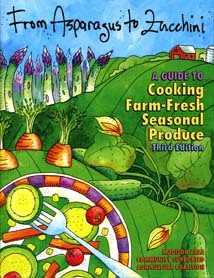 A Guide to Cooking Farm-Fresh, Seasonal Produce” is the perfect CSA companion. 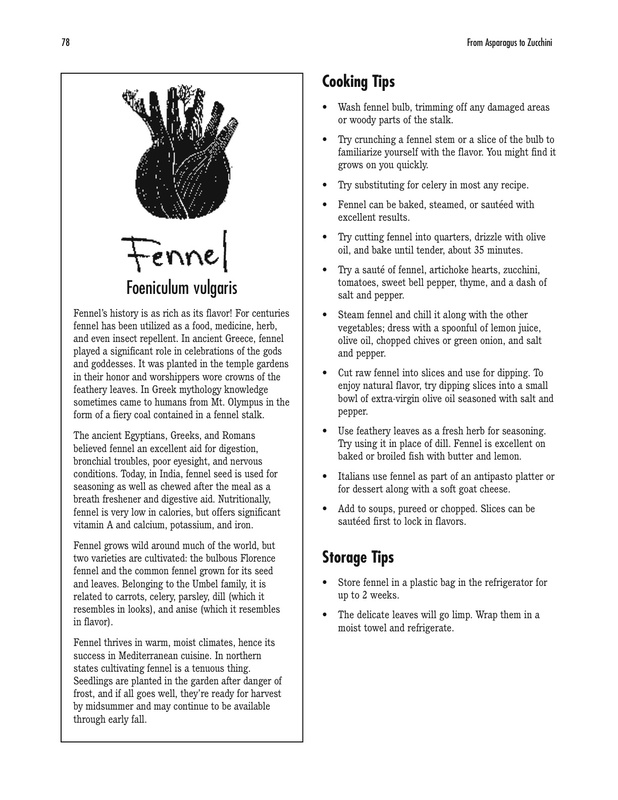 It is an educational guide as well as a cookbook. Recipes are organized alphabetically by vegetable and headed with a picture and species name for easy identification. The book offers natural history, storage information and preparation techniques for dozens of crops. Recipes from farmers and celebrity chefs alike are beautifully simple, bringing out the fresh flavor of the CSA season. Don’t skip over the “Food for Thought” section at the beginning, which illustrates the benefits of CSA that transcend taste. If you are a researcher like me, or want to learn more about food preservation, composting, food politics or gardening, head to the “Resources” list at the end of the book. If not, just use this versatile cookbook to enjoy the vegetables of the seasons. The Town that Food Saved: How One Community Found Vitality in Local Food was the perfect follow-up to Inquiries Into the Nature of Slow Money (previous post). Both books work to answer a critical question: how can a local food economy be viable? In The Town that Food Saved, investigative journalist Ben Hewitt sheds some ethnographic light on the local food movement in Hardwick, Vermont. As the town received press due to successful, what Hewitt calls agrepeneurial, local food ventures, Hewitt turned to the long-time inhabitants of the region displayed in the media as a local food utopia. Could Hardwick really serve as a model for local food economies across the country? What is a successful local food economy? 1. It must offer economic viability to small-scale food producers. 2. It must be based on sunshine. 3. It must feed the locals. 4. It must be circular. With a composting facility, a growing relationship between High Mowing Organic Seeds (read: squash flesh post seed-extraction) and Pete’s Greens (read: large kitchen), and a pig herd to eat expired cheese from Jasper Hill Farm, Hardwick’s food system is a closed one. The region has a high percentage of organic farms that steer clear of chemical fertilizers and rely instead upon careful farming techniques and the energy from the sun. 20-dollar-a-pound cheese from Jasper Hill Farm, $748/CSA share at Pete’s Greens, and heady home-state tofu, these new agrepeneurs are hanging in there. Much of that money undoubtedly stays in the region (there is a local food Community Supported Restaurant [!] called Claire’s and the Buffalo Mountain Food Coop in Hardwick), but the majority of the residents can’t afford to eat at Claire’s and would never dream of buying cheese from Jasper Hill. How can this be reconciled? These are great local food enterprises that are successful, and yet the people who live down the road from them cannot afford to buy their products. Well, these enterprises have created about 100 much-needed jobs in the area. The more food ventures the more jobs. It is unfortunate that many people in Hardwick are left out, but only if these new businesses are successful will the money trickle down. Unlike most businessmen, the agrepeneurs in Hardwick are trying to connect with the folks that live there and make locally produced food available to them. The Center for an Agricultural Economy is an organization in Hardwick. The vision and mission of the Center for an Agricultural Economy (CAE) is to ensure that consumers have access to healthy, secure, affordable and locally-grown food within our region, and that farmers and agricultural based businesses have reliable and efficient access to local and regional markets. Our bold vision is to build upon local tradition and bring together the community resources needed to develop and sustain a food system that is holistic in its approach. We recognize and support a healthy food system that encompasses soils, seeds, farms, transportation, processing & storage, distribution, consumers, enterprise and waste. We support the desire of rural communities to rebuild their economic and ecological health through strong, secure, and revitalized agricultural systems to meet both their own food needs locally as well as to determine and build the best opportunities for value-added agricultural exports. Is Hardwick the perfect model? Well, no. But it is on its way. I guess a more important question is: Will there ever be a perfect model? There will always be work to be done making our food system more sustainable. We must also keep in mind that any good local food system is place-based. It is true that part of Hardwick’s recent success is due to the young businessmen that have hopped under the limelight, but it is also because of the long-standing commitment to simple, agricultural lifestyles that have given the region a community-based vitality that many places have lost. 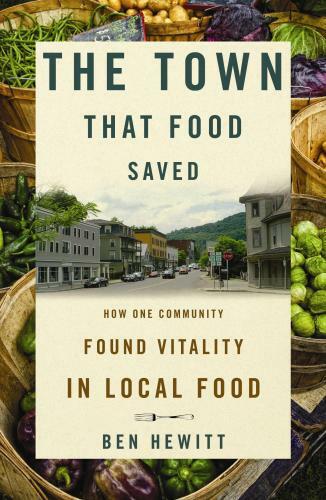 This was a fantastic book that examined local food through a lens of economic viability and cultural importance. Anecdotal evidence from living in the area combined with interviews with many community members, Hewitt comes from an anthropological perspective and says: We know local food is where we need to go. How can we get there? Slow Money: Investing as if food, farms and fertility mattered. I was introduced to the Slow Money initiative at the Real Food Challenge training back in February. Since then I’ve read the founder’s book: Inquiries into the Nature of Slow Money-Investing as if Food, Farms, and Fertility Mattered. 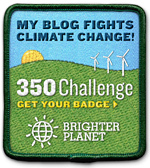 I’ve been hearing a lot about the Slow Money National Gathering, an educational weekend at Shelburne Farms in Vermont. starting with food and soil fertility. 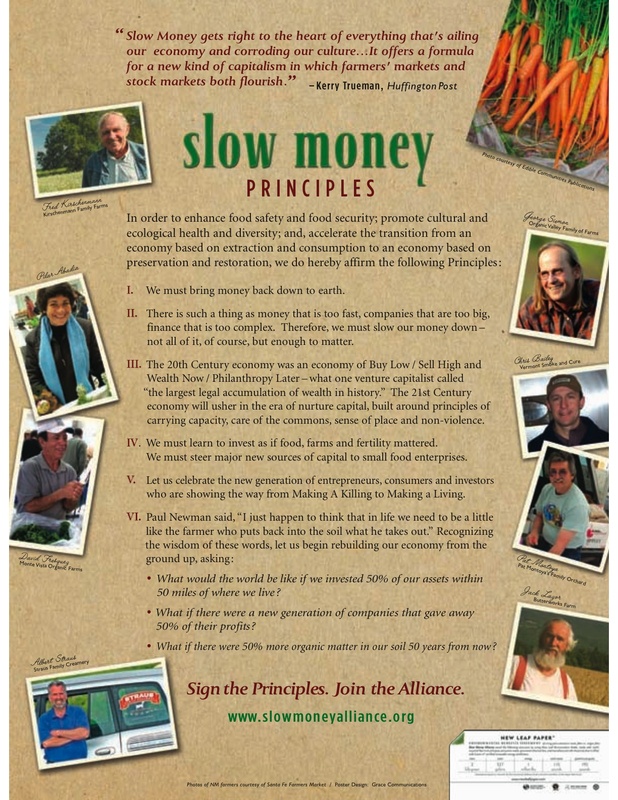 It is no mistake that Slow Money sounds a whole lot like Slow Food. The idea is to invest in your local food economy…really, to put your money where your mouth is. Investing in local food economies is buying into a future of fertility, sustainable farming practices, and community engagement. Like Slow Food, Slow Money advocates for personable food systems and resists this fast-paced, mostly destructive and divided market economy. Slow Money moves past “growth at any cost” and asks the critical questions: Which economies should grow? What types of businesses should be fostered? And maybe more importantly, which should not? And also: How can we create an economy that is built upon the well-being of its members and their natural environment? who are seeding the restorative economy. In his book, Woody Tasch challenges modern investment techniques of wealth now, philanthropy later. Instead of investing in destructive, but profitable ventures, invest in local initiatives. These local initiatives certainly won’t make as much money as investing in multinational or hugely popular businesses, but that is kind of the point. Investing in huge companies with illusive practises distances investors from their money. This often leads to investments that actually contribute to the problems they are intended to make money in order to ameliorate. Tasch brings up the Bill and Melinda Gates Foundation, which is the largest in the world. While one of its charitable missions is to improve health in Africa, the foundation invests in Nigerian oil exploration, a practice which pollutes local environments. Tasch offers mission-related investing as an alternative. Although mission-relating investing doesn’t generate as much money as conventional investing, less money has to be invested, and no money is needed to off-set damage if the venture is a success. On top of that, investors can begin to really invest in relationships and communities. What I mean by invest is to really have a stake in something, beyond just monetary goals. 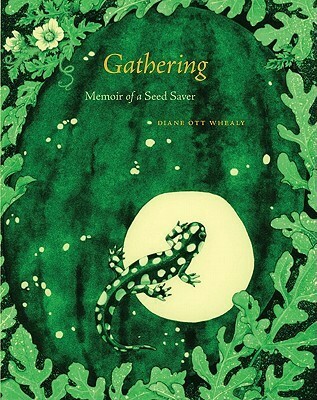 As you can see by reading about the National Gathering, the Slow Money idea is much less about money than it is about creating a new capitalist system, one in which money truly has value. Our current system is one of disconnect and, ultimately, of violence. This violence is the result of, in economic parlance, externalities. Slow Money envisions fiscal responsibility, both socially and environmently. Woody Tasch believes that the economy can grow, even if “externalities” are factored in. This economy would be down to earth indeed.